Grains, vegetables, and fruits should be eaten at most meals, because they are important sources of vitamins, minerals, energy, antioxidants, and fiber. An eating pattern high in these foods promotes good health and weight control when consumed wisely. Grains. The majority of grains should be whole grains, such as wheat, oats, rice, rye, barley, and corn. These grains are best consumed in whole, minimally-processed forms, because refining and processing can remove many valuable nutrients, including vitamins, minerals, and fiber. Grains and grain products common to the traditional Mediterranean Diet include: barley, buckwheat, bulgur, farro, millet, oats, polenta, rice, wheatberries, breads, couscous, and pastas. Vegetables. Vegetables are an important staple of eating patterns of peoples in all the countries bordering the Mediterranean Sea, providing valuable nutrients and satiety. These benefits are amplified because the vegetables are normally cooked or drizzled with olive oil. Raw vegetables are also a healthy vegetable option. Vegetables common to the traditional Mediterranean Diet include: artichokes, arugula, beets, broccoli, Brussels sprouts, cabbage, carrots, celery, celeriac, chicory, collard greens, cucumbers, dandelion greens, eggplant, fennel, kale, leeks, lemons, lettuce, mache, mushrooms, mustard greens, nettles, okra, onions (red, sweet, white), peas, peppers, potatoes, pumpkin, purslane, radishes, rutabaga, scallions, shallots, spinach, sweet potatoes, turnips, zucchini. Fruits. Whole fresh fruit is ever-present in the Mediterranean. No-sugar-added fruit juices provide only some of the same nutrition benefits as whole fruit, and attention to portion control and total calories is wise. Fruit “drinks” do not have the benefits of fruit juice. Fruits common to the traditional Mediterranean Diet include: apples, apricots, avocados, cherries, clementines, dates, figs, grapefruits, grapes, melons, nectarines, olives, oranges, peaches, pears, pomegranates, strawberries, tangerines, tomatoes. Olives and olive oil are central to the Mediterranean diet. Olives are universally eaten whole, and widely used for cooking and flavoring in the countries that border the Mediterranean Sea. Olive oil is the principal source of dietary fat used for cooking, baking, and for dressing salads and vegetables. Extra virgin olive oil is highest in health-promoting fats, phytonutrients and other important micronutrients. Nuts, beans, legumes and seeds are good sources of healthy fats, protein, and fiber. They add flavor and texture to Mediterranean dishes. Nuts, seeds, and legumes common to the traditional Mediterranean Diet include: almonds, cannellini beans, chickpeas, cashews, fava beans, green beans, hazelnuts, kidney beans, lentils, pine nuts, pistachios, sesame seeds, split peas, tahini sauce, walnuts. Herbs and spices add flavors and aromas to foods, reducing the need to add salt or fat when cooking. They are also rich in a broad range of health-promoting antioxidants, and are used liberally in Mediterranean cuisines. Herbs and spices also contribute to the national identities of the various Mediterranean cuisines. Herbs and spices common to the traditional Mediterranean Diet include: anise, basil, bay leaf, chiles, cloves, cumin, fennel, garlic, lavender, marjoram, mint, oregano, parsley, pepper, pul biber, rosemary, sage, savory, sumac, tarragon, thyme, zatar. Cheese and yogurt are eaten regularly in the traditional Mediterranean diet, but in low to moderate amounts. The calcium in cheese and yogurt is important for bone and heart health. Low fat and nonfat dairy products ease concerns of adverse consequences of somewhat higher consumption of dairy products. Dairy products common to the traditional Mediterranean Diet include: brie, chevre, corvo, feta, haloumi, manchego, Parmigiano-Reggiano, pecorino, ricotta, yogurt (including Greek yogurt). Fish and shellfish are important sources of healthy protein for Mediterranean populations. Fish such as tuna, herring, sardines, salmon and bream are rich in essential heart-healthy omega-3 fatty acids, and shellfish and crustaceans including mussels, clams and shrimp have similar benefits. Fish and shellfish are not typically battered and fried in Mediterranean countries. Seafood common to the traditional Mediterranean Diet includes: abalone, clams, cockles, crab, eel, flounder, lobster mackerel, mussels, octopus, oysters, salmon, sardines, sea bass, shrimp, squid, tilapia, tuna, whelk, yellowtail. Eggs are a good source of high-quality protein, and can be especially beneficial for individuals who do not eat meat. Eggs are regularly used in baking in Mediterranean countries. Chicken, duck, and quail eggs are all common to the traditional Mediterranean Diet. Meats are eaten in small portions by Mediterranean peoples, who prefer lean cuts. Poultry is a good source of lean protein without the high levels of saturated fat found in some cuts of red meat. With ground meats, 90 percent lean/10 percent fat is a sound choice. Poultry and red meat common to the traditional Mediterranean Diet include: beef, chicken, duck, goat, guinea fowl, lamb, mutton, pork. Water is essential for life, and proper hydration during each day makes a positive contribution to health, well being and energy levels. Individual variations in body sizes, metabolic rates and activity levels mean that some people should drink more water every day than others. 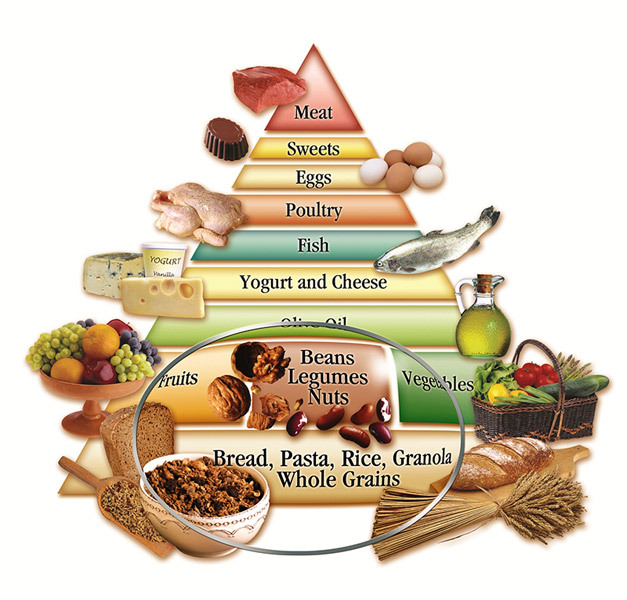 Because foods in the bottom section of the pyramid may be eaten in larger amounts and more frequently, portion sizes and frequency of consumption decline in the pyramid’s upper sections. Moderation is a wise approach. A balanced and healthy diet accommodates most foods and drinks, so long as moderation and wise choices are the key characteristics. For example, enjoying a small piece of birthday cake, savoring a few slices of grilled steak, or relaxing with family and friends with a glass or two of wine or beer are important aspects of being human. As always, moderation is the wise watchword. Daily physical activity is important for overall good health. This includes strenuous exercise like running and aerobics, as well as more leisurely activities such as walking and housework or yard-work, or taking the stairs instead of the elevator. The Mediterranean Diet is grounded on the principles of enjoyment and pleasure. Foods, drinks and meals are best eaten with others, when possible, and savored. As you follow the Mediterranean Diet, keep in mind that weight control is very important for good health. Establish your healthy weight range from your doctor or from reputable web sites, and let this healthy weight range be your guide. If you are above this range, cut back on the food and drink you consume, add more exercise, or both. For most people, counting calories obsessively not only detracts from enjoying foods, drinks, and meals, but also doesn’t work very well in the long term. These recommendations and the updated Mediterranean Diet Pyramid are reliable for most adults. However, children and pregnant women and others with special dietary needs may require dietary supplementation. These needs can be accommodated within the Mediterranean Diet in most circumstances.